Instead of a pill, hospital patients at San Francisco General Hospital (SFGH) might be handed a prescription for vegetables such as kale and beets. And those prescriptions are filled and picked up on-site. The Therapeutic Food Pantry located at SFGH is one of a growing number of facilities swapping pills and supplements for fruits, veggies and proteins. The prescription food program enables doctors and healthcare providers to prescribe fresh fruits and vegetables along with other healthy items to patients as part of a road map to sustained health and wellness. The secret ingredient powering the trend? Foodservice directors who work in tandem with physicians and dietitians to prepare meals. The 320-bed hospital isn’t equipped with a food pantry, but it’s still actively participating in a “medicinal” food approach. Argenta counts herself among a legion of FSDs aligning with physician and dietitian networks to adopt a precise, patient-specific meal regimen. And while some directors respect the idea, they believe the terminology “food as medicine” doesn’t send the appropriate message. One example of “food with purpose” at Boston Children’s is its proprietary Lemon Ginger Chicken Soup, which is prepared in place of traditional chicken noodle soup. Argenta, a registered dietitian who sources 20% of Lurie’s food from local producers, says the overarching concept has staying power. Lurie “took a deeper dive into wellness” in 2014, she says, by aligning with the Partnership for a Healthier America (PHA) to address obesity in children. Lurie’s endgame is serving wellness meals of 500 calories or fewer, with some examples being a PBJ sandwich with carrots and grapes; a chicken breast with whole grain, fruit and vegetable; and a hamburger on a whole-grain bun. To Argenta, two elements underpin the effort: healthy, from-scratch foods coupled with a cohesiveness between foodservice, physicians and dietitians. 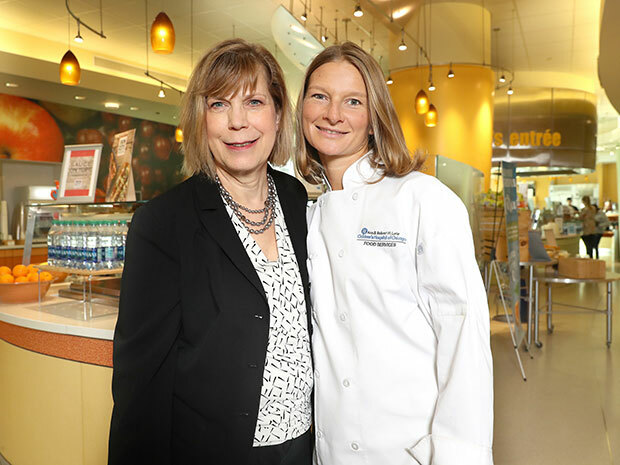 Due in part to its PHA affiliation, Lurie Children’s developed a laser-focused team approach to serving medicinal-oriented food, with a key acknowledgement. “The doctor is the captain of the ship,” Argenta says. Deployment of intuitive software, diet manuals and the hospital call center are all integral to the execution, says Argenta, who’s employed by Aurora, Ill.-based Morrison Healthcare, Lurie’s third-party foodservice provider. There are a lot of moving pieces, as Lurie has a network of 32 clinical dietitians overseen by 10 team leaders, who all interact with Argenta’s program, which consists of 70 hourly cooks, servers, dishwashers and others. Traditional dialogue, particularly within the Lurie network of dietitians, coupled with electronic tools informs Argenta at every turn. At SFGH, patients get access to nutrition education programs relevant to certain diseases and health goals, along with food demonstrations hosted in its demonstration kitchen so people can learn how to prepare certain foods. They are also given approximately 25 pounds of food per visit, which typically feeds a family of four for five days. Some receive “max assist” from the pantry, which means they can return every two weeks for as many refills as indicated by their provider, according to SFGH. Outside the hospital setting, directors at senior living communities such as Taylor are adopting the concept to serve an aging clientele, with a medicinal twist enabled by seamless communication.